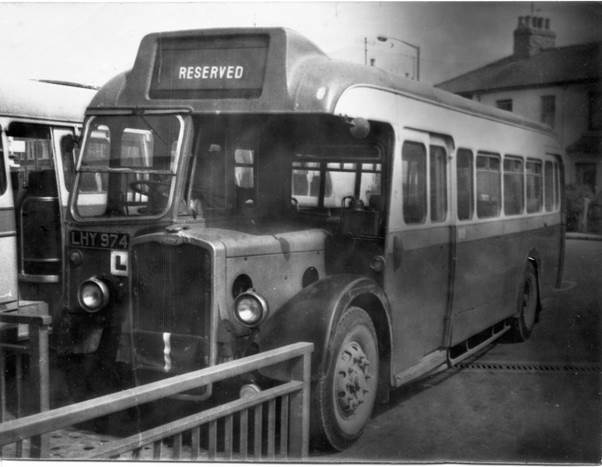 Back in 1970 we visited Scotland, mostly travelling by train but using bus and ferry when appropriate. One ferry trip was from Mallaig to Kyle of Lochalsh which enabled us to arrive on the west coast via the West Highland line and return east again on the Kyle line. Planning our itinerary in those pre-internet days involved a lot of library work where timetables were available. We just had time to fit in a crossing to Kyleakin on Skye from where we saw Loch Seaforth departing on the next leg of her journey. It is clearly dramatic scenery as we look back to the mainland with the ferry setting out. These days, of course, the Skye Bridge takes you over the sea to that island. Not everybody likes it, but I’m a fan. My first sight of the Forth Bridge was from a train crossing it in 1970. It ought to have been perfection. 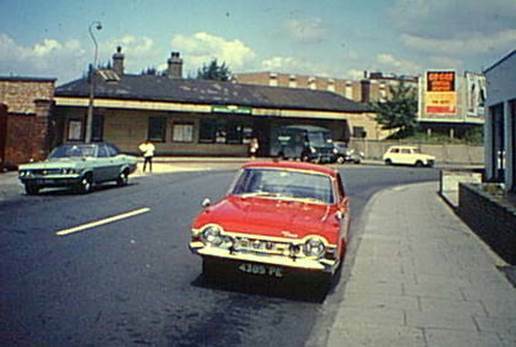 1970 was the era of diesel trains which gave passengers a view past the driver and out of the front of the train. My wife (then fiancée) and I had the very front seats. We were set for a grandstand view. But it was not meant to be. The Firth of Forth was swirling in really quite thick fog. The bridge itself was barely visible even though I was on it. My good old little Canon Demi did its best and this is what I got. The train made good progress for AWS (which could stand for audio warning signalling) was in place. At regular intervals we could see the AWS ramp as the train ran over it and here the all clear bell for the driver. Even so it was quite disconcerting heading into the fog filled void at speed. And that has remained, so far, my only train trip over the bridge. Of course, I have been up there by car and used the Forth Road Bridge which gives a chance to stop and enjoy both eras in bridge technology. The 19th century bridge by Fowler and Baker is certainly magnificent. This photo dates from 2005. 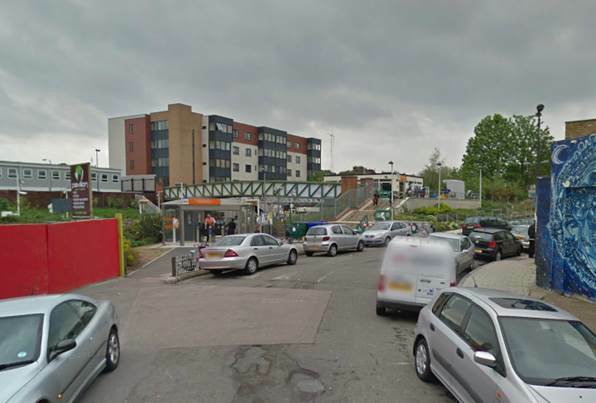 The road bridge, of course, has had much publicised problems but is presumably OK now. By 1970 I had finished my training and was about to commence work. I had become engaged to be married and we, my fiancée and I, headed off to tour Scotland by train, bus and ship. We had planned an itinerary that would get us to most places accessible by rail and had included a ferry ride up Loch Lomond and also from Mallaig to Kyle of Lochalsh. We also got to the station most distant from London, at Wick and used a bus to get from there to John o’ Groats. I clearly felt I should send my Dad a postcard from this far flung location and here it is. And here’s the very short message. 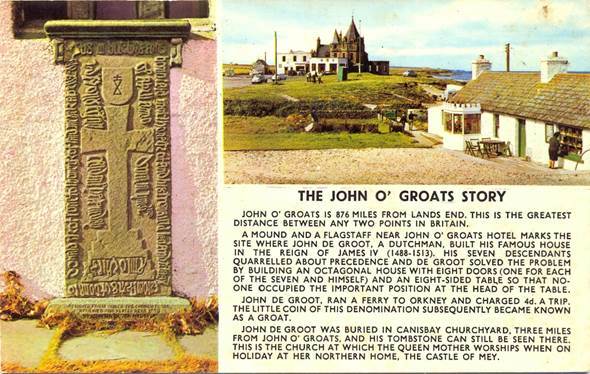 So, this was written on 21st August 1970 and postmarked John o’ Groats the next day. I have hidden the address for members of the family still inhabit that area although not the same house. I see it cost 4d to send a stamp then, just a few months before February 1971 when the UK adopted a decimal currency. The stamp is a Scottish issue one. Dad had recently remarried, after the death of my mother in 1967 so obviously, his new wife was included in the recipients. If anybody thinks I was niggardly with the information sent home to Dad be assured that other cards sent have so much small writing crammed on to them that I can barely read them. I feel incredibly lucky to have travelled on Loch Lomond on the paddle steamer, ‘Maid of the Loch’. This old paddle steamer still exists. It was 1970 and my (then fiancée) and I were youth hostelling in Scotland. I can tell you this was a grand holiday for me as we did much of our travelling by train, covering the West Highland line, The Kyle Line and the far north line. 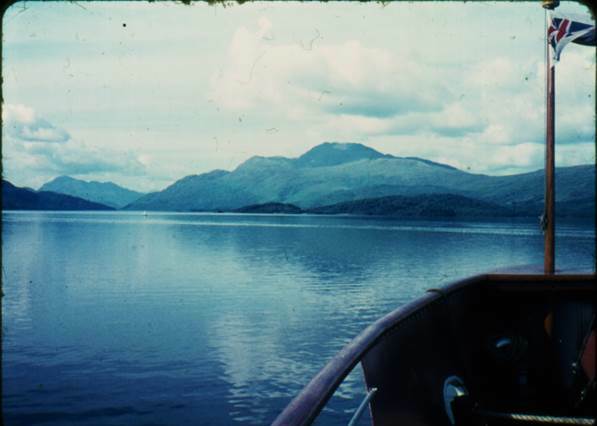 We also used ferries and one of them was from Balloch Pier to Tarbet and this was our trip on Maid of the Loch. The memory of sound shifts in the Glasgow area stick with me. As we awaited the arrival of the Maid at Balloch Pier an excited Glasgow youngster saw her coming and called, ’Mammy, It’s a beg shap’. Or, as we Sassenachs might say, ‘Mummy, it’s a big ship’. I surely have a photo of The Maid somewhere. This was the era of half frame colour slides on my little Canon Demi camera. What I have here is a bit of the sharp end and a view of Loch Lomond and Ben Lomond. I have driven up past Loch Lomond several times since and I have to say I find it hard to actually get to the banks to find out if they are ‘bonny’. But on Maid of the Loch it was a glorious experience and I am delighted to have made that trip. Yet I do have one regret for it means there is a part of the West Highland railway – the bit alongside Loch Long – that I have still never travelled. Finding my leather key fob from Knaresborough, yesterday, found me another item which I thought was worthy of remembering on the good old blog. It was my AA key, still attached to that leather fob. I just took it off so that it would lie flat for a photo. 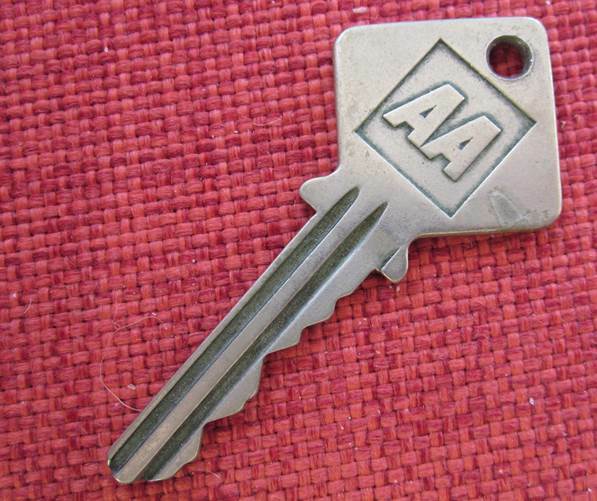 Back in days past, members of the Automobile Association all had such a key. Scattered around the country the AA and the rival RAC had special phone boxes for members. They were more spacious than the standard box and had little extras like notepaper and pencil inside. This key has no great age. I became a car owner in 1970 so it probably dates from then. It has the ‘modern’ font for AA. Earlier keys had a font that was rather more antique looking. Of course, I don’t own this key. As a member of the motoring organisation – who would thus come to help you in the event of a breakdown – I was entitled to hold a key. The reverse of the key makes this ownership clear. I could have used the in about 1000 boxes. Now there are but 19 preserved and maintained. Well, we all use mobile phones now! So I have another useless souvenir of a past time.